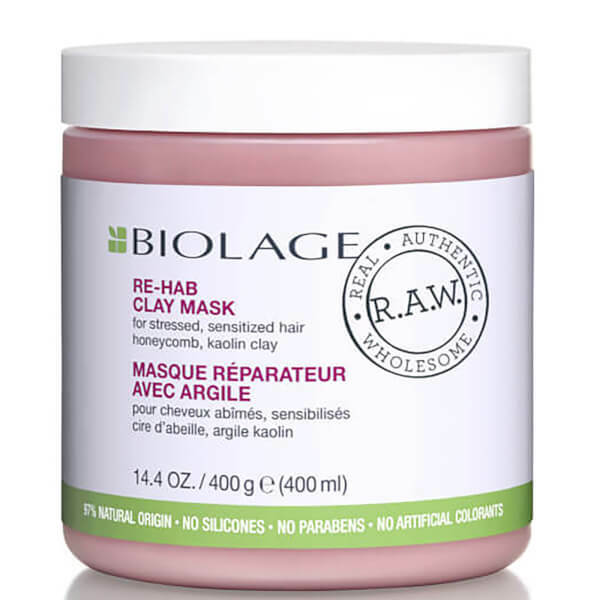 Take care of damaged hair with the Biolage R.A.W. 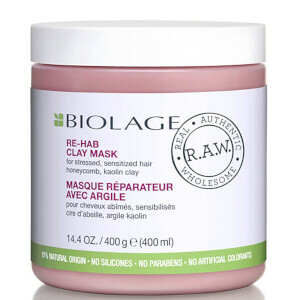 Re-Hab Mask. Harnessing the nutritional properties of powerful natural extracts, the rich formula veils hair with an essential blend of moisture and vitamins, ideal for stressed and sensitised hair in need of extra TLC. Enriched with extracts of Honeycomb and Kaolin Clay, the deep conditioning treatment leaves locks feeling stronger and replenished with superior shine and manageability. After shampooing, smooth on from roots to tips. Leave in for 5 minutes, rinse thoroughly. Aqua/Water/Eau, Cera Alba/Beeswax/Cire Dabeille, Cetearyl Alcohol, Butyrospermum Parkii Butter/Shea Butter, Coriandrum Sativum Seed Oil/Coriander Seed Oil, Brassicamidopropyl Dimethylamine, Glyceryl Stearate Se, Helianthus Annuus Seed Oil/Sunflower Seed Oil, Isopropyl Palmitate, Parfum/Fragrance, Benzyl Alcohol, Sclerotium Gum, Caprylyl Glycol, Tartaric Acid, Salicylic Acid, Kaolin, Tocopherol, Sodium Hydroxide, Glycine Soja Oil/Soybean Oil, Linalool, Citric Acid.